PORTLAND, Oregon/BOSTON, Massachusetts – An algorithm that uses artificial intelligence can automatically and more accurately diagnose a potentially devastating cause of childhood blindness than most expert physicians, a paper published in JAMA Ophthalmology suggests. The finding could help prevent blindness in more babies with the disease, called retinopathy of prematurity, or ROP. Musician Stevie Wonder went blind due to this condition. The algorithm accurately diagnosed the condition in images of infant eyes 91 percent of the time. On the other hand, a team of eight physicians with ROP expertise who examined the same images had an average accuracy rate of 82 percent. "There's a huge shortage of ophthalmologists who are trained and willing to diagnose ROP. This creates enormous gaps in care, even in the United States, and sadly leads too many children around the world to go undiagnosed," said the study's co-lead researcher, Michael Chiang, M.D., a professor of ophthalmology and medical informatics & clinical epidemiology in the OHSU School of Medicine and a pediatric ophthalmologist at the Elks Children's Eye Clinic in the OHSU Casey Eye Institute. "This algorithm distills the knowledge of ophthalmologists who are skilled at identifying ROP and puts it into a mathematical model so clinicians who may not have that same wealth of experience can still help babies receive a timely, accurate diagnosis," said the other lead researcher, Jayashree Kalpathy-Cramer, Ph.D., of the Athinoula A. Martinos Center for Biomedical Imaging at Massachusetts General Hospital, who is also an associate professor of radiology at Harvard Medical School. 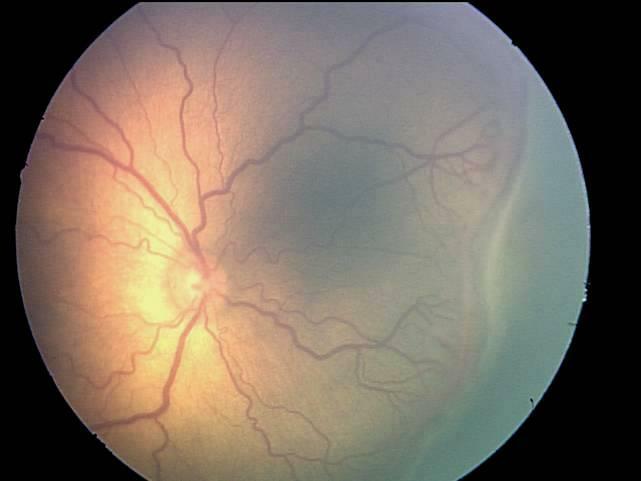 Retinopathy of prematurity is caused by abnormal blood vessel growth near the retina, the light-sensitive portion in the back of an eye. The condition is common in premature babies and is the leading cause of childhood blindness globally. The National Eye Institute of the National Institutes of Health reports that up to 16,000 U.S. babies experience retinopathy of prematurity to some degree, but only up to 600 become legally blind each year as a result. The condition is becoming more common as medical care for premature babies improves. The disease is diagnosed by visually inspecting a baby's eye. Physicians typically use a magnifying device that shines light into a baby's dilated eye, but that approach can lead to variable and subjective diagnoses. Artificial intelligence, also called AI, enables machines to think like humans and is a growing field in health care. Last month, the FDA approved an AI device that detects diabetes-related eye disease. Others have tried developing computerized systems to diagnose retinopathy of prematurity, but none have been able to match the accuracy of visual diagnosis by physicians. This algorithm specifically uses deep learning, a form of AI that mimics how humans perceive the world through vision, including identifying objects. The MGH researchers combined two existing AI models to create the algorithm, while the OHSU researchers developed extensive reference standards to train it. They first trained the algorithm to identify retinal vessels in more than 5,000 pictures taken during infant visits to an ophthalmologist. Next, they trained it to differentiate between healthy and diseased vessels. Afterward, they compared the algorithm's accuracy with that of trained experts who viewed the same images and discovered it performed better than most of the expert physicians. The full research team is now working with a collaborator in India to see if the algorithm can diagnose ROP in Indian babies as well as it did for the group of primarily Caucasian babies involved in this study. They are also exploring whether the algorithm can diagnose the condition in images of other parts of the retina besides vessels. The ultimate goal is to enable physicians to incorporate the technology into their clinical practices. The paper's co-lead authors are James Brown, Ph.D., a research fellow at MGH and Harvard Medical School, and J. Peter Campbell, M.D., M.P.H., an assistant professor at the OHSU School of Medicine. The paper was published on the same day as talks about the algorithm at ARVO 2018, the annual meeting of the Association for Research in Vision and Ophthalmology. The institutions involved in this study were OHSU, Massachusetts General Hospital, University of Illinois at Chicago, Northeastern University, University of Miami, Columbia University Medical Center, William Beaumont Hospital, Children's Hospital Los Angeles, Cedars-Sinai Medical Center, LA Biomed at Harbor-UCLA Medical Center, and Asociación para Evitar la Ceguera en México. This research was supported by the National Institutes of Health (grants R01EY019474, P30EY10572, P41EB015896 & T90DA022759/R90DA023427), the National Science Foundation (grants SCH1622542, SCH1622536, SCH1622679), Research to Prevent Blindness, and the Oregon State Elks. PAPER: James M. Brown, J. Peter Campbell, Andrew Beers, Ken Chang, Susan Ostmo, R.V. Paul Chan, Jennifer Dy, Deniz Erdogmus, Statis Ioannidis, Jayashree Kalpathy-Cramer, Michael F. Chiang, "Automated diagnosis of plus disease in retinopathy of prematurity using deep convolutional neural networks," JAMA Ophthalmology, May 2, 2018, DOI: 10.1001/jamaophthalmol.2018.1934, https://media.jamanetwork.com/news-item/can-an-algorithm-detect-signs-of-a-serious-eye-disease-in-premature-infants-like-human-experts/. J. Peter Campbell, "Artificial intelligence in retinopathy of prematurity: clinical validation of a fully automated deep learning system (i-ROP DL) for plus disease diagnosis," Presentation No. 3936, 8:45 a.m. Hawaii time, May 2, 2018.